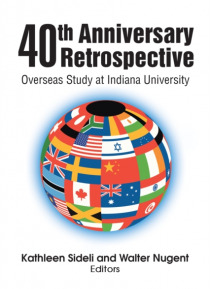 This 40th Anniversary Retrospective presents the reminiscences of the directors of Indiana Universitys Office of Overseas Study, from its creation in 1972 until the present day. They recount not only how IU faculty and administrators selected partners and locations around the world but also how they established systems at the university to facilitate student access and participation. Integratin… g such programs into a large public institution of eight campuses posed challenges as well as opportunities. While study abroad today is considered a high impact educational activity that students expect from a college experience, the eight authors show how unique such opportunities were just a few decades ago. Faculty and administrators who are tasked today with designing education abroad programs for students will appreciate and learn from this comprehensive overview of administrative and academic know-how. And those who had similar experiences during the past few decades will commiserate with the trials and tribulations inherent to internationalizing an institution of higher education.